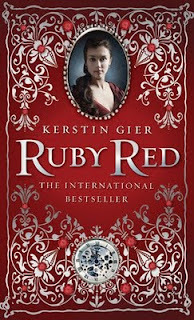 Ruby Red is the story of a young girl named Gwyneth who can travel through time because of a family gene. Only problem is: everyone was expecting her cousin, Charlotte, to be the one who inherited the gene - not Gwyneth. So while Charlotte's been trained in different languages and history, Gwyneth has just been a normal teenage girl her entire life - that is, of course, until she finds herself back in time. Gwyneth is the "ruby" - the 12th and last in a series of time travelers. But there's something strange going on. No one will fully explain things to her, and for some reason, one of the fellow time travelers before her tried to stop the entire thing. Will Gwyneth unravel the mystery surrounding her family's abilities? I thought this book was completely adorable. Gwyneth is a loveable, funny character whose wit and charm make her immediately likeable. Her best friend, Leslie, is one of my favorite characters as she Googles everything and anything that happens to Gwyneth. There's also the hot guy, of course. His name is Gideon and he also comes from a family of time travelers. In the beginning, he looks down on Gwyneth for having had no formal training, but I'm sure, by the next book, he will be as in love with her as we are. 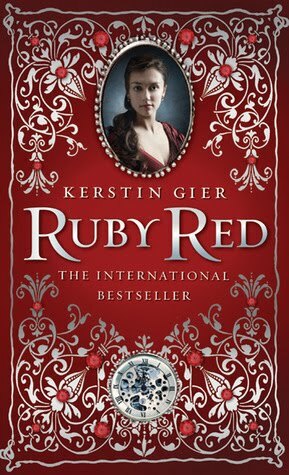 I would say Ruby Red is a good read. It was funny, it wasn't bogged down with too much of the science behind time travel and it kept me entertained until the very last page. Check it out and LET ME KNOW WHAT YOU THINK!! I'm currently reading The Hourglass Door Trilogy which also involves time travel. It's fascinating, and Ruby Red sounds like it would be too. I'll definitely add to my TBR pile.